NOTE: TYPO IN THE IMAGE - its a two day, it was July 30-31! Standard Style is one of those sites I came across a few years ago when I had a renewed interest in denim. I was searching for Paper Denim & Cloth jeans, and was happy to find that this site offered a lot of other stuff I could see myself wearing too, like the much-loved 3.1 Phillip Lim, SEE by Chloe, and of course Marc by Marc Jacobs. I love the selection of brands for both girls and guys. 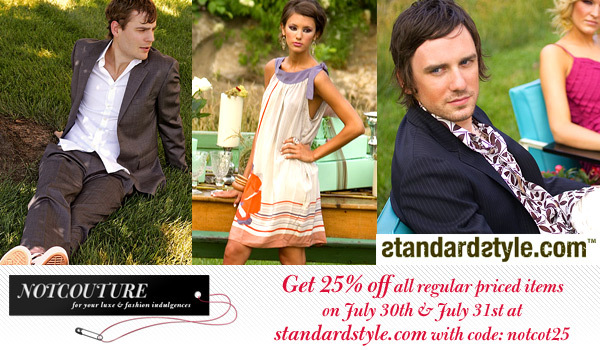 The folks at Standard Style are nice enough to offer a special discount to NOTCOT readers to celebrate the launch of NotCouture this week! The 25% off discount code: notcot25 is valid starting on July 30th at midnight Mountain Time, and will run through Tuesday, July 31st Midnight. Happy shopping! Not sure where to start? How about check out some NotCouture Standard Style picks below? Here are a few of NotCouture picks from Standard Style if you need some shopping inspiration on what to use that 25% off on! Click the pics to see more!